One of the benefits of the e-commerce boom in India is that we no longer have to wait for the revolutionary, life-altering apps making waves internationally. The next set of entrepreneurs have their sights set on transforming the fitness and wellness industry. Fiticket is one of the many seemingly simple subscription services which allow users to explore a wide variety of big-name gym chains, boutique workout studios and otherwise inaccessible exercise regimes for a one-time fee. With over 450 partners and counting in Mumbai, Fiticket is one of the more comprehensive services of its kind with a core team made up of professional athletes, certified trainers and nutritionists. The sign-up is simple enough and the website allows you to browse through all your options before requesting a payment. Some neighbourhoods like Bandra (West) and Andheri (West) have large clusters of fitness hubs making a Fiticket pass a more promising proposition. I opted for a weeklong trial ( ₹ 499) despite just one gymnasium listing in my immediate vicinity (Fitness Hub Gym in Worli) because I found plenty of fun workout options in nearby neighbourhoods including Tai Chi, Zumba, kickboxing, capoeira, spinning, several types of yoga, pilates and aerobics as well as running with expert marathoners like Miles Drego. In the past, I’ve been tricked into joining dancercise classes without a trial and paying for hefty annual gym memberships disguised as “heavily-discounted, limited period" schemes. I was impressed by Fiticket’s transparent operations. During my trial week, I attended a Hatha Yoga Beginners class at The Yoga House (where a trial class is priced at ₹ 450) and a Bollywood Boom Dance Workout at Temperance (where trial classes are priced at ₹ 500), both extremely popular venues in Bandra (West). Booking and checking into the sessions was fairly simple—I had to share a unique Fiticket code assigned for each venue with the receptionists. Though I felt like an intruder at the start of the classes, both instructors were forthcoming and put me at ease when I felt like I wasn’t up to speed with the regulars. There are at least five venues that offer swimming along with other fitness regimes on Fiticket and a dip at the third-floor pool at the C’est La Vie club on Hill Road in Bandra (West) was easily the highlight of my week with Fiticket. The clunky user interface on the web and Android applications with hundreds of listings across a dozen or so pages for each date can seem daunting to an exercise novice despite the time, location and activity filters. The iOS app is more streamlined and the company is working on updates for the other platforms. Initially, we made several calls to the Fiticket team to inquire about premium venues, scour for uncommon exercise routines and reschedule our classes. The subscription service allows users to sign up for unlimited classes but there is a three-to-five class limit at most venues in any given month. Once you use your monthly quota, you can switch to another fitness studio or sign up for more sessions at the venue directly. While this makes the service ideal for city dwellers looking for a slight twist to their routine dose of active living, it may not work for those who value structure in their exercise regime. There are no sporting activities on offer at the moment. A weekly trial subscription is priced at ₹ 499 and includes an online consultation with a dietitian and a month-long pass is priced at ₹ 1,799 or ₹ 2,249 with diet consultations. Quarterly and annual plans are available at ₹ 4,499 and ₹ 14,999 respectively and ₹ 5,499 and ₹ 19,999 with diet and nutrition planning. 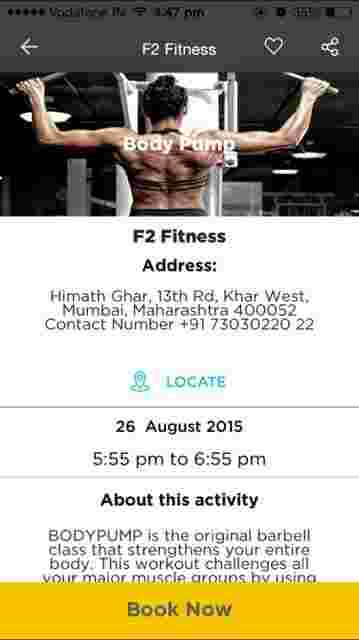 See Fiticket.com for more details and to download the iOS or Android application for free.